The Arts Expo Event was a great day at Martinsburg Mall. If you missed it check out our video to get a taste of what you missed. 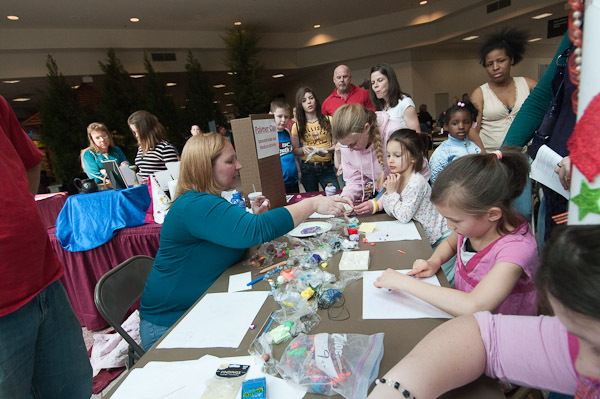 Kids and adults gather around Leia Wood's table to learn about making cool things with polymer clay. The Berkeley Arts Council’s first annual Arts Expo was a great success, with fun and entertainment, and of course, the arts, for adults and kids! If you missed it, you missed it! Also, check the excellent writeup in the Sunday Journal. We’re already planning for Arts Expo 2012 and we would love to have your participation! Here are answers to some questions: Q) Can a dancer enter more than one category? A) A dancer can enter once in the solo/duet category, and can also be part of one group entry. Q) Can a group enter more than one dance? A) Up to half of a group can also participate in a second group entry, but the limit is two entries per dancer. Q) I need to get more parents’ signatures. Can I send the roster form when it is complete? A) Yes, but we still need your registration form and fee payment mailed by the 19th. We need to know the ages and categories you are entering so include a copy of the roster form(s). We need all signature no later than the auditions on April 10. A reminder: all registered entries will receive an information packet after March 23. Admission to the auditions is free for registered performers, and one parent/coach per entry. For others, tickets are $5 for adults and $2 for students. More questions? Email youcandance@berkeleyartswv.org or call 304-262-1611. Tuesday, March 15 at 7:30, the Fairmont State University collegiate choir will present a free concert at the Apollo Theatre. What a wonderful musical opportunity for our community! NOW, THEREFORE, BE IT RESOLVED that the Berkeley County Council does hereby proclaim that March 19, 2011 shall be designated as Arts Appreciation Day for 2011, to recognize the value of the Arts to our community, the importance of Arts in education and the contribution of the Arts to quality of life for our residents. We’re working energetically to promote our upcoming events, the Arts Expo, the Juried Exhibit, and “Show Us You Can Dance“. We got a much appreciated boost from Christine Miller Ford and Panhandle Magazine, supporting us by providing ad space in the debut issue, which is due out shortly. Check out the publication. Your subscription helps build networking efforts for the arts that we all benefit from. The Jury Results are In! Congratulations to the artists whose work was selected for the exhibit! The Juror selected 36 works in a variety of media by 29 artists from around West Virginia and 4 other states. A list of the selected artists is listed on the Berkeley Arts Council web site. The Berkeley Arts Council is collaborating with The Arts Centre in Martinsburg, WV to produce this exhibit with the theme “Art and Earth: My Art – My World” as part of the city-wide “Art and Earth Celebration” that includes the “Art and Earth Festival produced by ArtBerkeley at War Memorial Park in Martinsburg. The Juror for the exhibit was Susan Bloom, Professor and Chair of the Art and Art History Department of McDaniels College in Westminster, Maryland. Ms Bloom is an accomplished teacher, artist, photographer and author. We hope that there will be a great turnout for the reception at The Arts Centre, Friday, April 8 from 5-7pm.